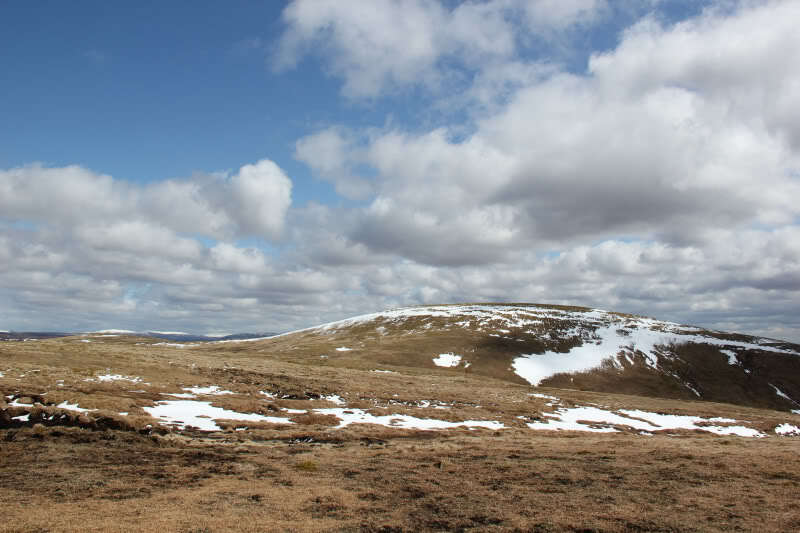 A second-round ascent of Carn na Caim and A’Bhuidheanach Bheag has been in the planning for several weeks. 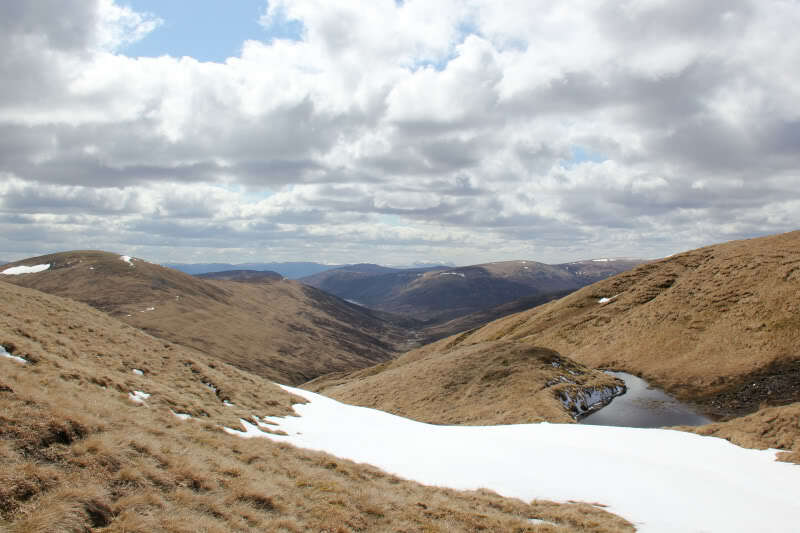 As well as ascending Carn na Caim and A’Bhuidheanach Bheag - both current Munros, my aim today was to also ascend Meall a’Chaorainn and Glas Mheall Mor – both Munros in Hugh Munro’s original 1891 list. 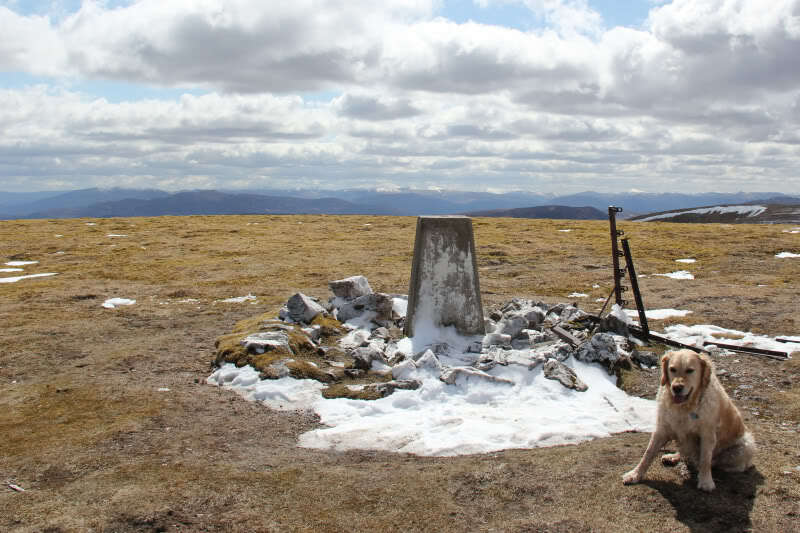 Glas Mheall Mor is now a Munro Top. 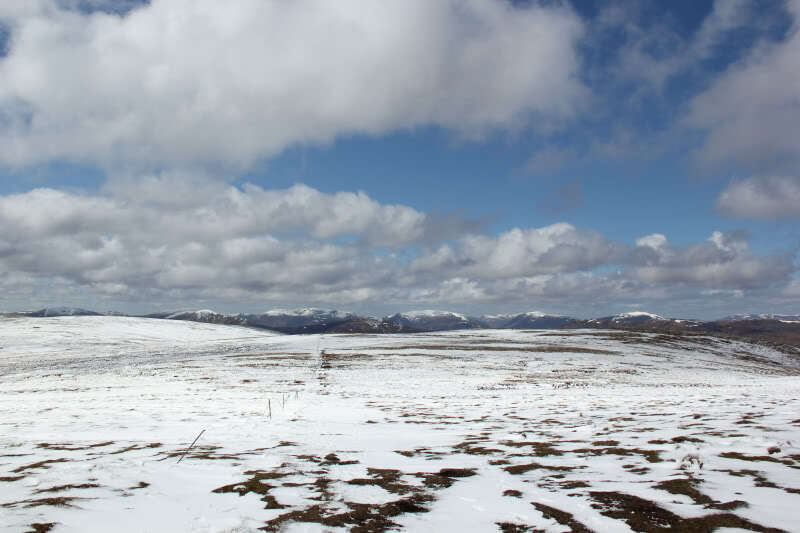 I last ascended Carn na Caim and A’Bhuidheanach Bheag in May 2000. 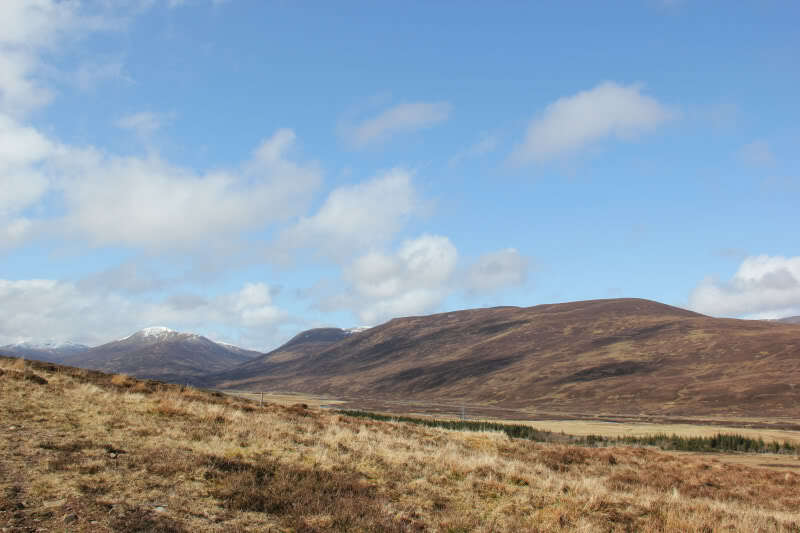 I set off from home around 08:00 and arrived at Drumochter by 09:45 – a relatively short journey compared with some recent, and some forthcoming, trips. I parked in the large lay-by across the road from the hills. 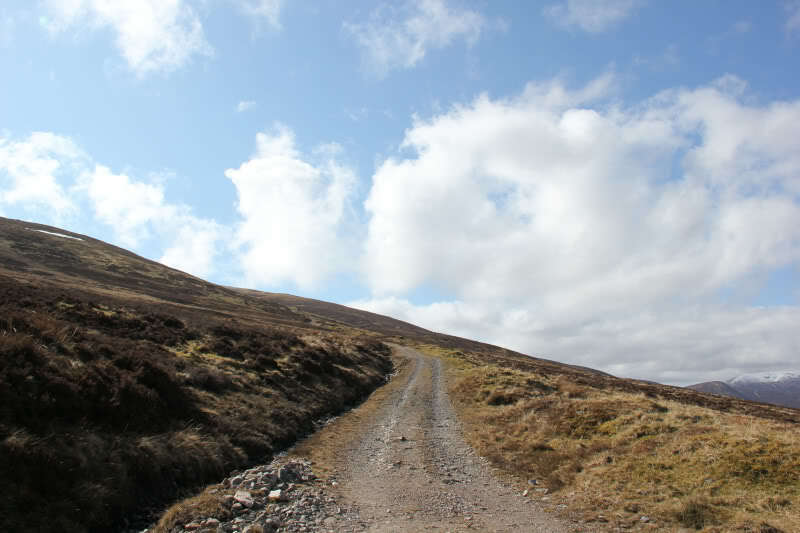 I set off with Beinn along the wide vehicle track which ascends to > 900m. 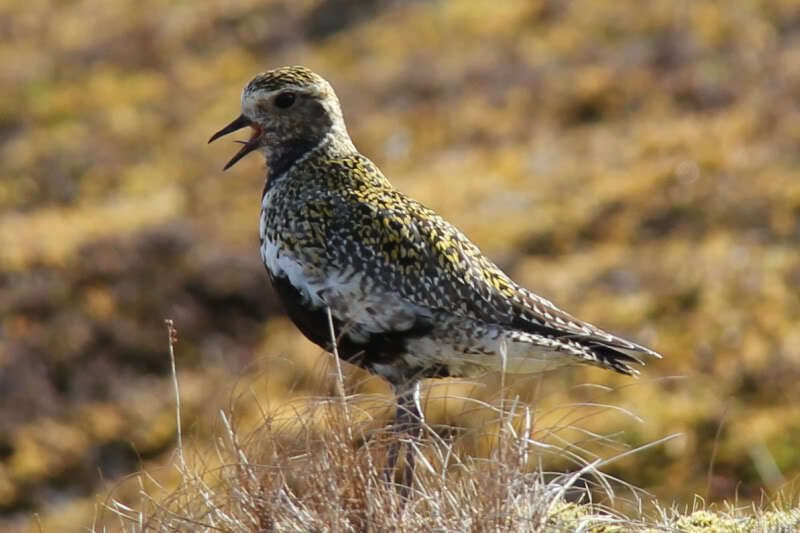 The ascent was not that interesting until I spotted a Golden Plover. It was kind enough to stay relatively still just long enough for me to get a couple of photos. 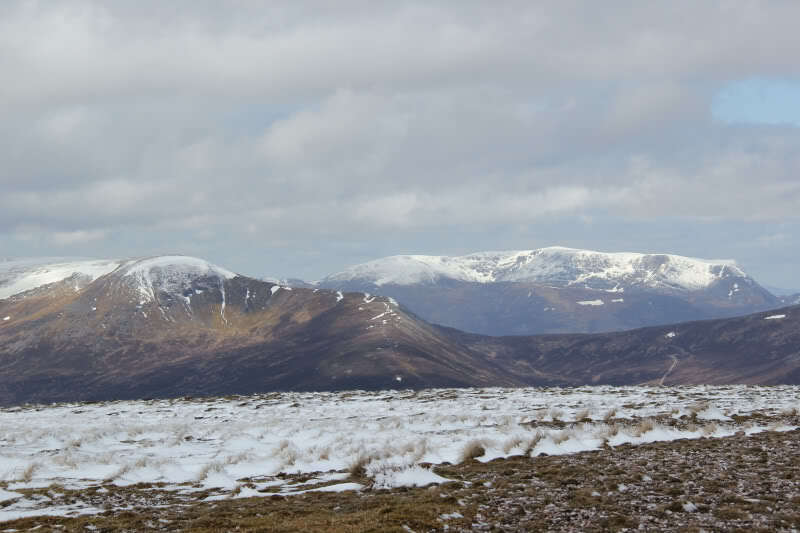 From c.750m upwards, the track was filled with snow – this pleased Beinn. 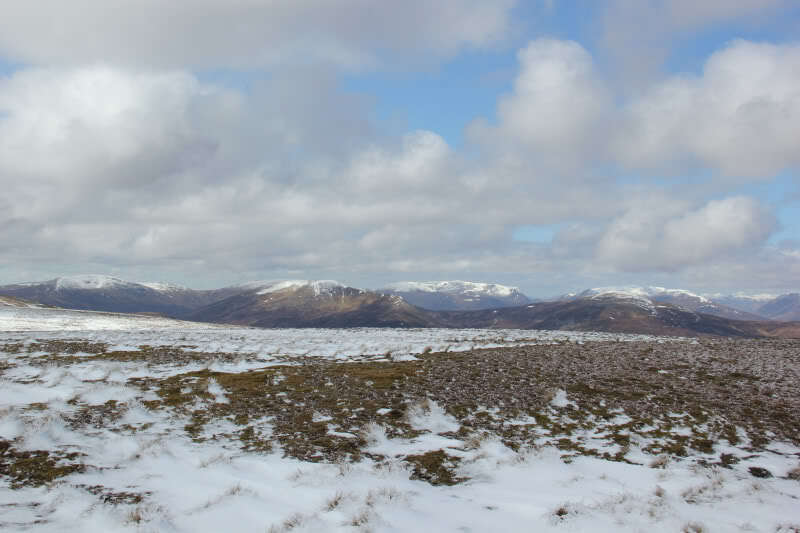 It was nice to get views across to Ben Alder during the ascent. 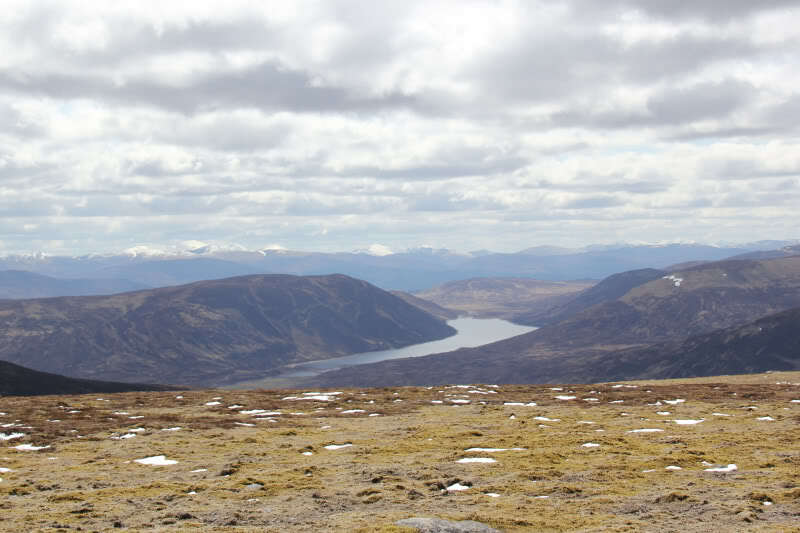 A re-ascent of Ben Alder is definitely on my to-do list too. 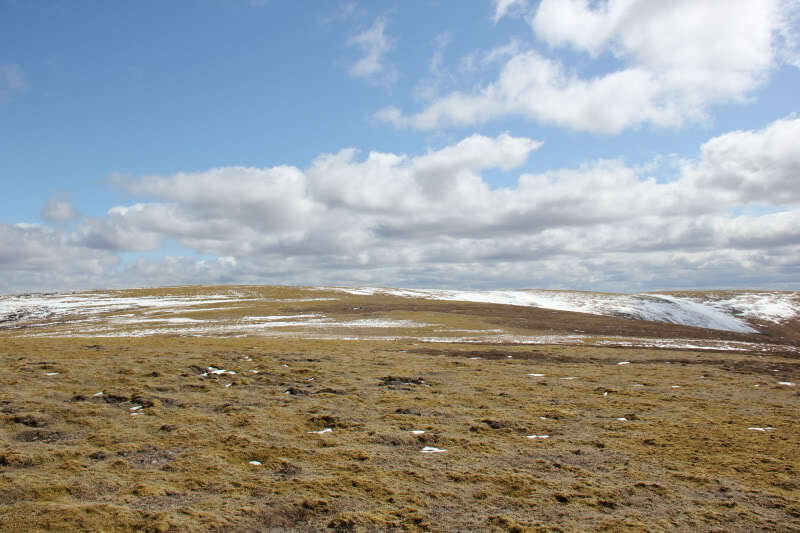 After reaching the 902m top, I made my way across to Carn na Caim, via the 914m top. 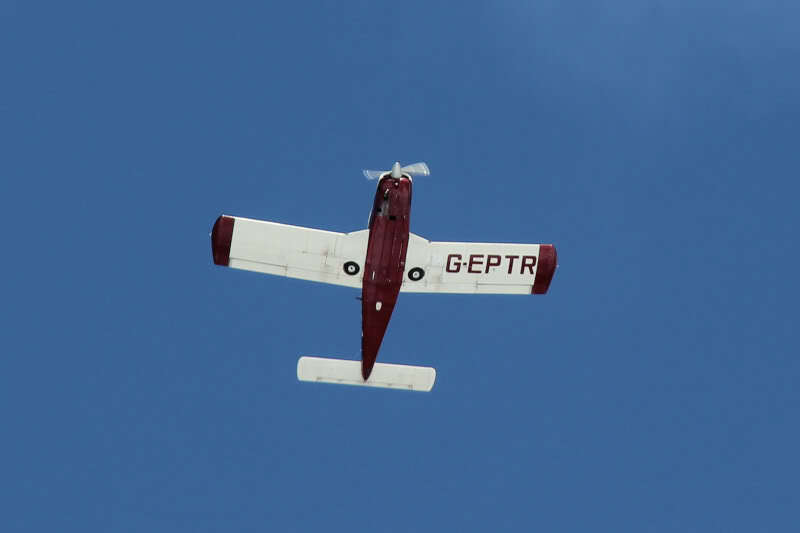 As I walked along the track a nice wee plane flew overhead. 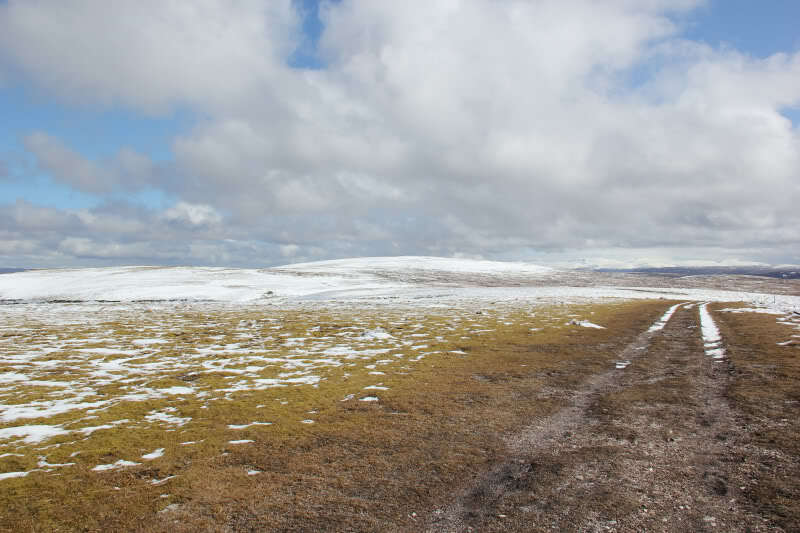 On approaching Carn na Caim, I met six people going the opposite way. 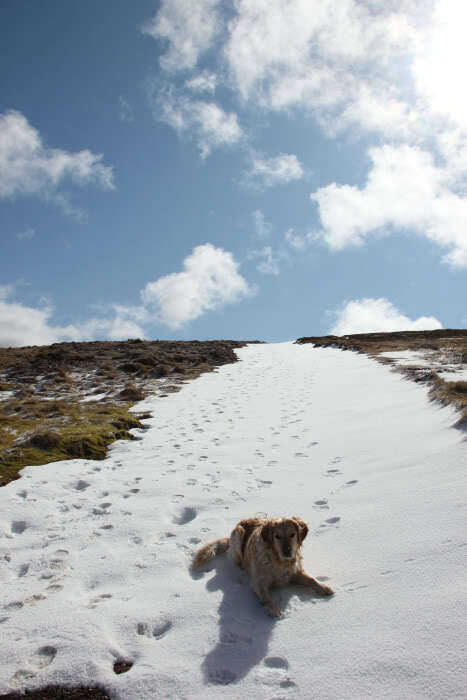 I found it a bit amusing when one asked if my dog was ok, re-assured me that “I didn’t have far to reach the summit” and questioned, was I also doing “the other one” . I didn’t spend long at the summit. 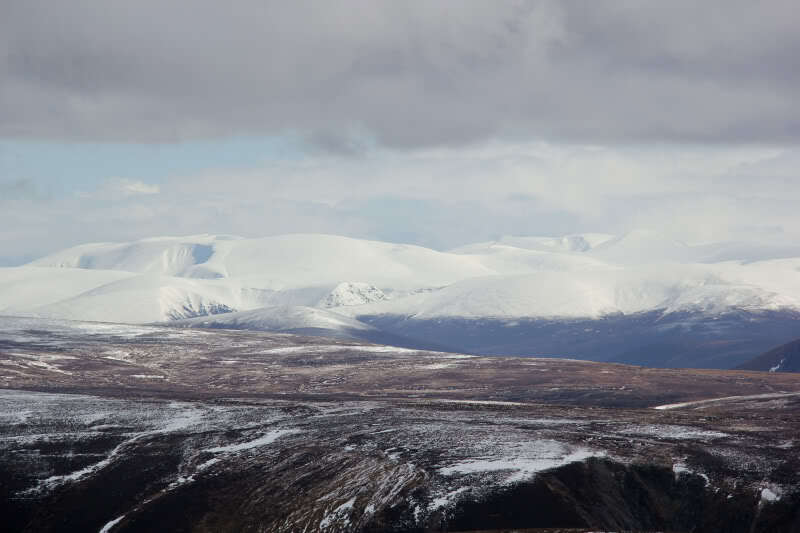 I was quite surprised at how much snow there is again on the Cairngorms! 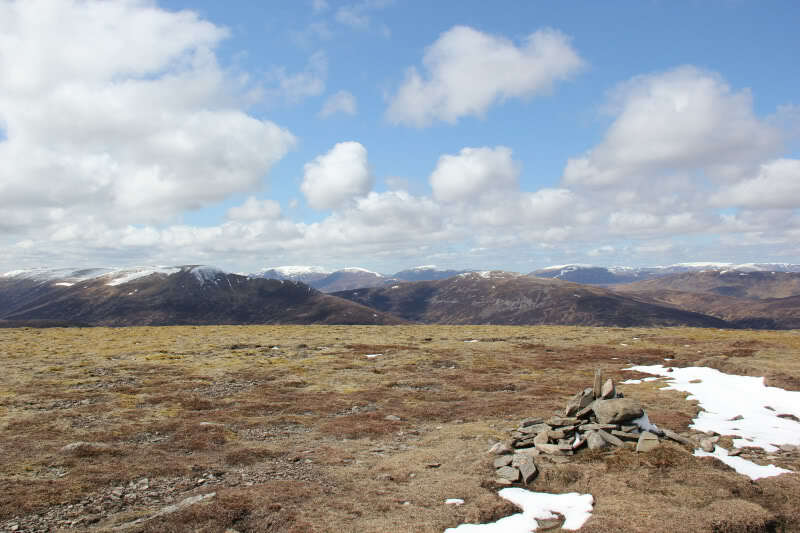 From Carn na Caim, I returned the same way as far as the 902m top. 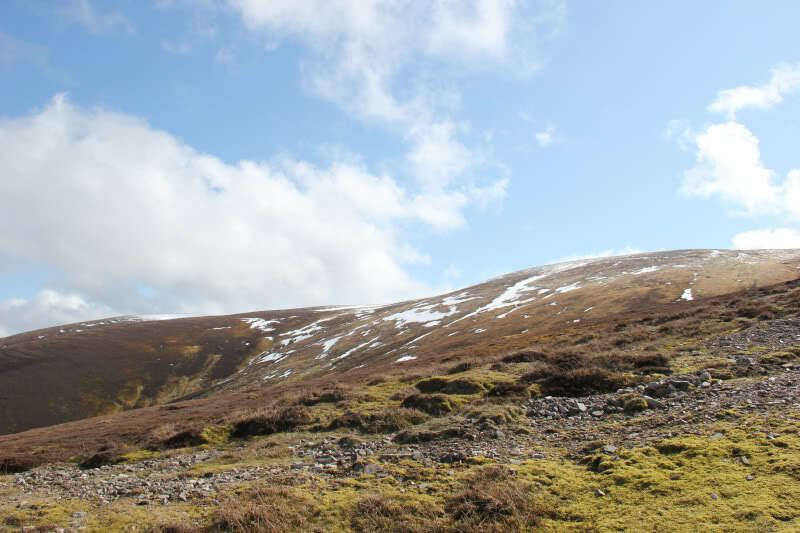 I then made my way across to A’Bhuidheanach Bheag via A’Bhuidheanach (879m). 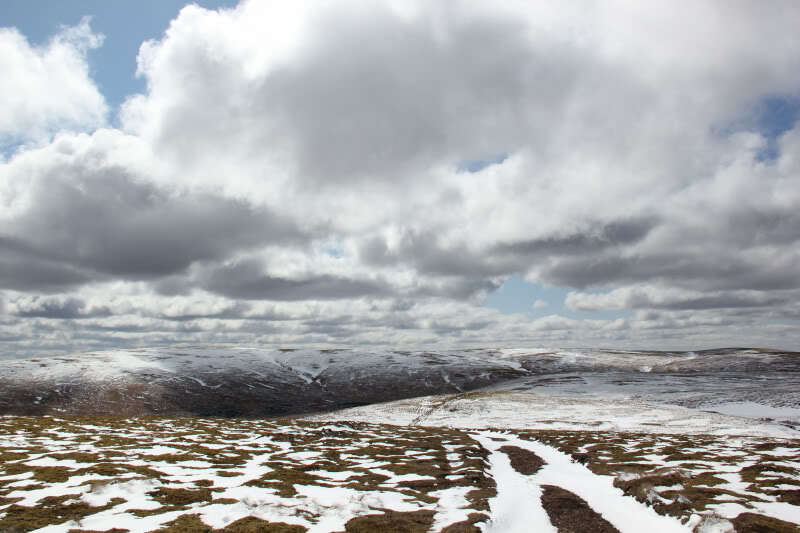 While ascending A’Bhuidheanach Bheag, I decided to head for Meall a’Chaorainn first. 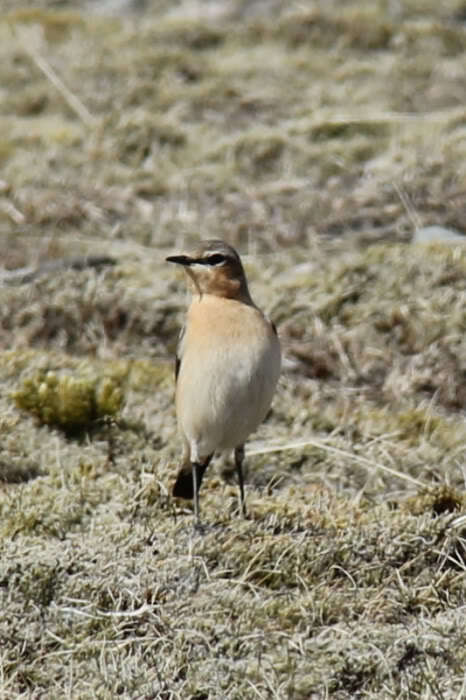 Just below the summit of Meall a’Chaorainn I spotted a Wheatear. 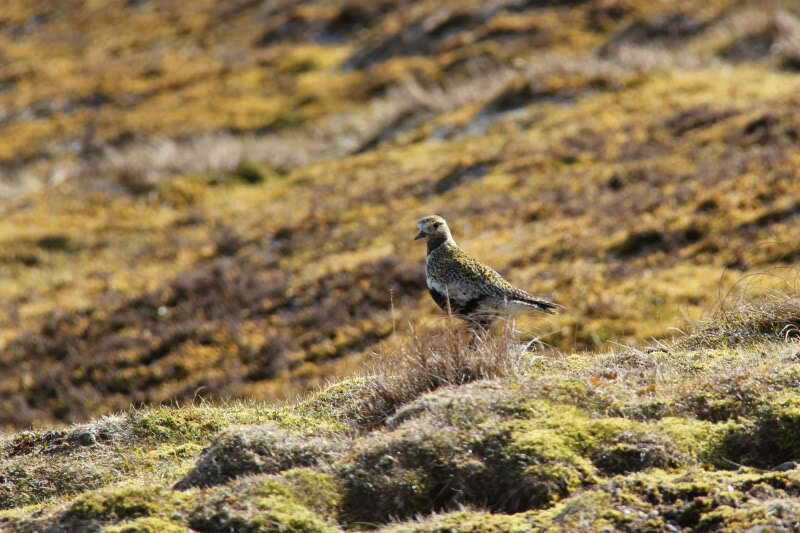 Beinn started to prowl like a cat towards it, but I think he forgot that he was on a lead and soon got jerked back and told to behave. 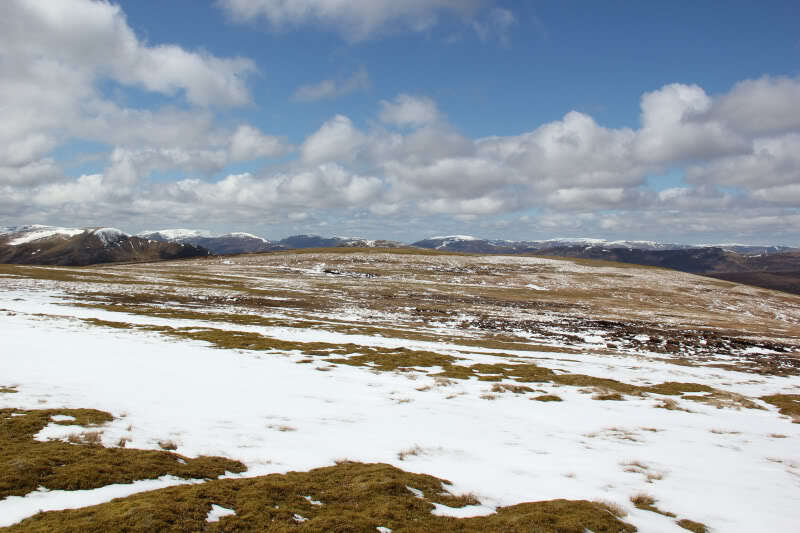 I was quite impressed with the views from Meall a’Chaorainn. It is definitely a better viewpoint that A’Bhuidheanach Bheag. 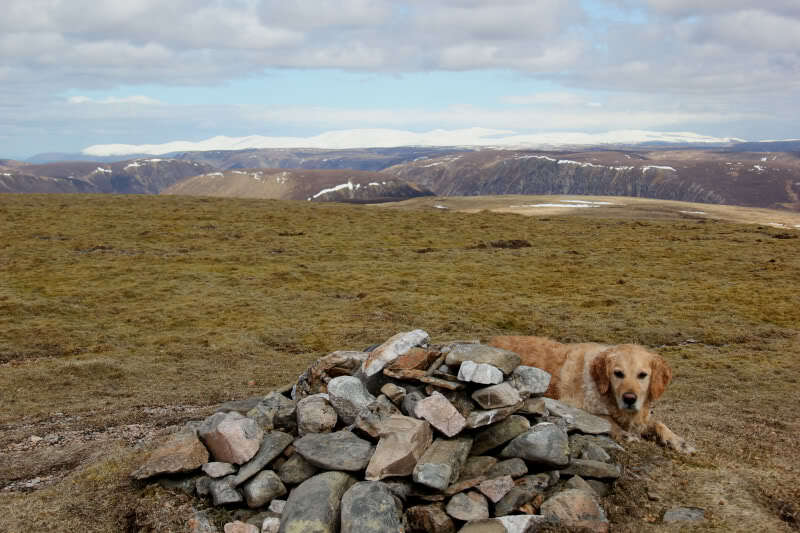 I’m not sure why Hugh Munro made this one a Munro – I assume due to mapping inaccuracies of the time. It doesn’t even feel like the top of a hill. 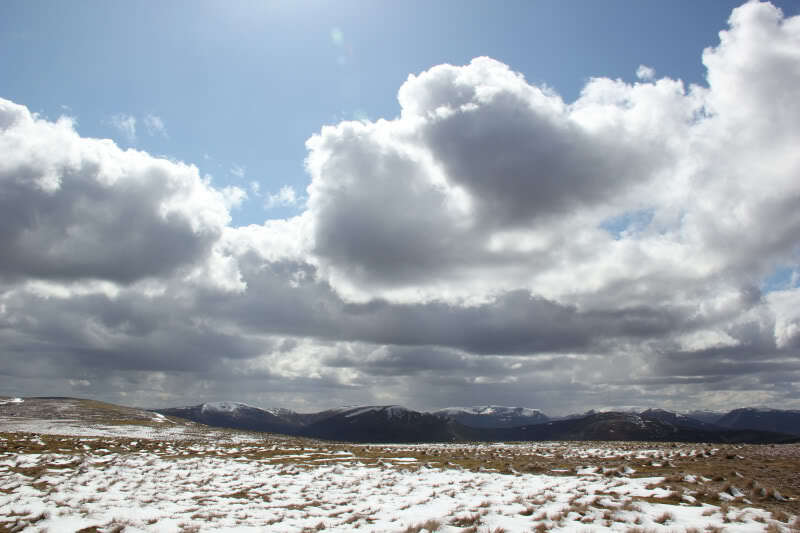 From Meall a’Chaorainn, I made my way across to A’Bhuidheanach Bheag via the un-named 936m top. After a quick photo stop, we made our way towards Glas Mheall Mor. 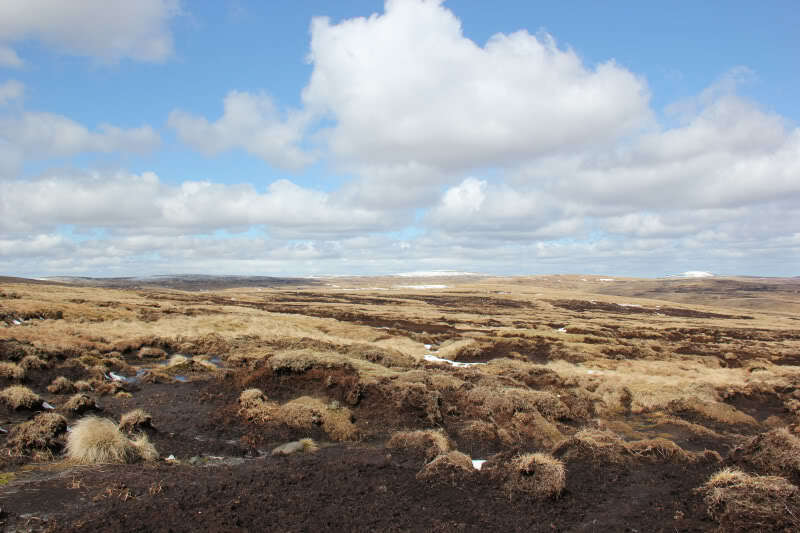 The expanse of land between A’Bhuidheanach Bheag and Glas Mheall Mor is quite rough-going with lots of peat. 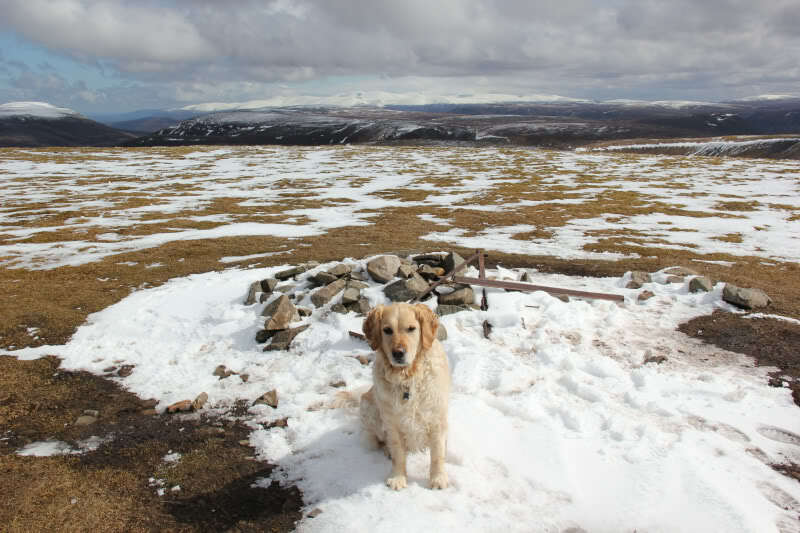 Was nice to reach the summit of Glas Mheall Mor – my second deleted 1891 Munro of the day – only 10 more original 1891 Munros left to do! 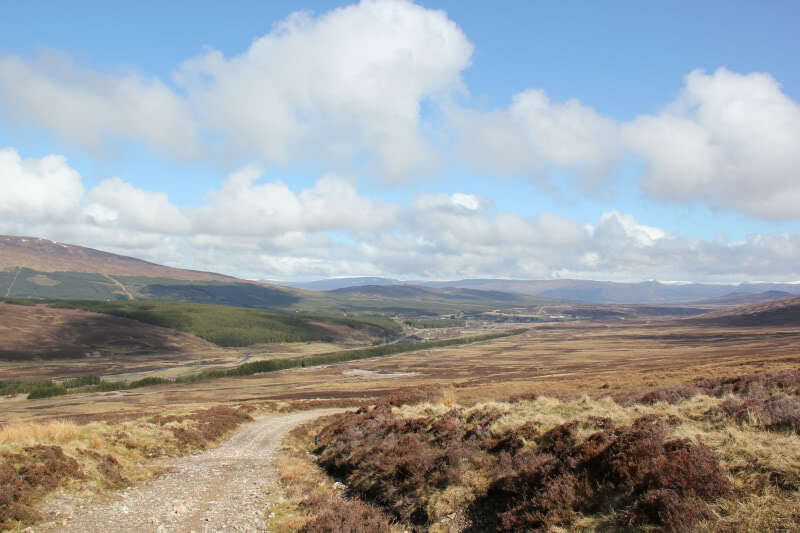 The return to A’Bhuidheanach Mhor was not pleasant – lots of peat but thankfully quite firm. Despite some threatening rain clouds, it stayed dry throughout.